Instant Pot Fajitas are all the rage. At least, at my house Instant Pot Fajitas are all the rage! This Tex-Mex dish is easy to create in your kitchen and so simple to adapt to your family preferences. Get out your Instant Pot, you’re going to love this recipe! Who doesn’t love a sizzling plate of fajitas? Every time I go to a restaurant and someone orders fajitas I ooooh and ahhhh (to my self, of course) when the plate goes by. I oooooh and ahhhh, but I never order fajitas in restaurants unless I’m in the “nothing looks good on the menu and fajitas are the safest bet here” frame of mind. Why? Because I have a rule about NOT ordering menu items I can easily make at home. I also have a rule about not ordering menu items I make better at home (this list usually includes pancakes, biscuits, and of course, fajitas). 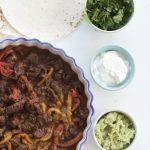 Instant Pot Fajitas has to be one of the easiest dinner dishes ever. Meat, sliced vegetables, a few spices, and a hot pan. Just like that, you have dinner! The beauty of fajitas is simple, fresh, tasty, and you can turn the heat level up or down to please your crew. AND if you’re using the Instant Pot, you can use cuts of meat that are not usually found in fajitas, meaning meats with less fat because of the tenderizing of the meat in the Instant pot. Many recipes for fajitas call for skirt steak, which can have a lot of marbling (fat) and usually has a higher price point than say, round steak which is lower in fat and usually quite a bit less expensive. As I discussed in my Instant Pot, Now What? post, I’ve found that browning meat or veggies improves the flavors in the finished dish. I’m sold on browning before cooking in the Instant Pot. I’m also a fan of adding flour during the browning process. It’s an easy way to thicken the sauce. Pressure cooking traps most of the liquid inside of the pot, which creates extra moist meats, but can leave sauce a bit watered down. Adding a little flour in the browning stage helps offset watery sauces. My husband is a bow hunter. As in, he takes a bow and arrows and goes hunting. You can read more about his bow hunting obsession here. We often have elk steaks in our freezer, because he is committed to using the meat or donating it to the food bank if we have an abundance. This presents a challenge for me… how to cook 500 lbs of elk meat and make it taste good? Here’s the challenge with wild game. It is extremely lean meat. As in, almost no fat. The problem with no fat in wild game- it’s difficult to cook without drying out. Enter the Instant Pot. Wow, I have to say my wild game cooking challenges are over! For years I have tried everything under the sun to cook elk meat in particular, and avoid drying out the meat. Even slow cooking is a challenge because the meat can still turn out dry in the long cooking process. The Instant Pot cooks the meat at a high temperature and locks in all of the moisture through pressure cooking, which is the best method I’ve found for cooking lean meats, another huge benefit of using the Instant Pot. Now that you’ve heard my take on the simpicity of fajitas, why I never order fajitas in restaurants and my challenges cooking wild game, you are ready to plunge in and make this recipe! Everyone who tried this dish loved it, and so far, I think it’s my favorite Instant Pot recipe. Great for a crowd or a couple of people. Turn the Instant Pot to the SAUTE mode and let it heat up without the lid on while you prep the meat. Combine chili powder, salt, pepper, garlic powder, onion powder, oregano and cumin in a bowl or Ziplock bag. Place cut up meat into bag with seasonings, seal and give the bag a good shake. Massage the seasonings into the meat. Set aside. You can also do this up to three days ahead if you'd like and store in fridge. The Instant Pot should be heated up at this point. Pour the oil into the pot and then throw the meat and chopped onion in as well and stir while browning. When the meat is browned, squeeze the lime juice over the meat and add flour and continue to cook until the flour disappears. If the mixture seems a bit dry, add a little olive oil. Add water or broth to the meat and onion mixture in the pot. Place the lid on the pot (make sure the seal is in place inside of the lid, and the pressure valve is turned to the sealing position (not to the venting position). Lock the lid in place to CLOSE. Hit the MEAT/STEW setting or manually enter 35 minutes. The pot will automatically start the cooking process when the time is selected and the lid is in the close position. Let the meat cook until the timer is finished (about 45 minutes from the time it starts cooking) and then let the pressure release naturally for about 10-15 minutes. When you are ready to serve the fajitas, release the remaining pressure in the pot using the pressure release valve. Turn the valve to the VENTING position. Remove the lid when pressure is released, and add the remaining sliced vegetables (peppers). Close the lid again and hit the STEAM setting. I let the veggies steam for about 5 minutes or less and then place the pressure release to the VENTING position. Serve fajita filling with warm tortillas, guac, and sour cream. -This recipe may be adapted to use up to 3 lbs of meat with the same amount of spices. -The spice level in this dish is moderate. If you would like to tone down the heat, mix the spices together, and use about half of the spice mixture on the meat. You may also add double the amount of liquid to reduce spice/heat level. These were amazing! The meat was so delicious–even our kids ate it. Thank you for posting this. I’m looking forward to more instant pot recipes. Could you make this with chicken? Yes- you can substitute chicken in this recipe. If the chicken is thawed, cook for 8-10 minutes. I hope you enjoy this delicious recipe and cooking with the IP! OMG my first time out with my brand new instant pot that my kids bought me for my birthday, and yours was the recipe we started with tonight. A.MA.ZING!!! Thank you so much for sharing this easy and delicious recipe. Im a HUGE fan of the Instant Pot too! I’m honored that the first dish you tried was an ABK recipe! Give the others a try, I know you’ll love them! These were delicious!! The meat was so tender! I’m new to the Instant pot and really appreciate this recipe and am excited to try your others, thank you! Haley, I’m in love with the Instant Pot! I think you’ll love all of ABK’s Instant Pot recipes. Thanks for reading ABK! All I can say is…WOW!! Not only was this recipe easy to make, it was DELISH! My husband’s reaction after his first 3 bites made me chuckle. Let’s just say he loved every morsel! Hahaha! Thanks for another fam favorite. Katherine, So glad your hubby loved this recipe! Isn’t it so satisfying when you cook something your family loves?! Thanks for your note and for reading ABK. Thanks Laura! We loved this too, glad it was a hit at your house! Love this recipe!!! The flavor was so good, meat was moist and the vegetables were done just right. I loved all of the suggestions and the mixture of flavors. One of my new favorites. Five star rating for sure! Thanks Lorie! Glad you loved this recipe. It is one of our favorite Instant Pot recipes! Loved this recipe! The flavors were amazing, the meat was tender and the vegetables were done just right. Loved all of Si’s suggestions. One of my new favorites. Could this be made with tri-tip instead of skirt steak? I haven’t tried it with tri tip, so I am not sure how it will turn out, but my guess is yes. Let us know if you try it! If I’m only making this for two, can I cut the recipe in half? Yes you can but I would suggest making the recipe and freezing half for later. When you’re having a crazy day, you’ll be glad you have dinner ready to go. Love this recipe!! I’m new to the instant pot, can you tell me how to adjust for chicken instead of beef? Thanks!! I would try 10 minutes for cooking time with chicken. It cooks quickly and does not need extra time in the pot as compared to the beef I used in this recipe. The chicken will dry out if cooked for 30 minutes. Try ten minutes after sautéing, and then let the steam/pressure release naturally for about 10 minutes. Let us know if you try it! i don’t have an instant pot, how could i adapt this recipe for a crock pot? How much can this recipe be scaled up? Feeding 20. The Instant Pot i Use is a 6 QT. After the recipe is complete, my IP is only about 1/3 full. This recipe could definitely be doubled, maybe even tripled in the 6 qt pot. Hi! Do you think I can use a thin chuck steak for this recipe? Sorry I missed this question earlier! yes, a thin cut church steak will work in they recipe! This sounds amazing. However, I think I could saute/grill the meat faster and have the whole meal on the table faster instead of using the instapot. 45 min cook time and 10 min for steam release. If grilling, the time would be maybe 10 -15 min, remove meat and saute the veggies for 5 min. I’m looking to the instapot to decrease my prep/cook time and my time in the kitchen. I had the same thoughts. We did try this recipe with chicken, just to learn how to use the insta pot, and it was DELICIOUS, but the time issue was definitely not what I would have hoped for with fajitas. I agree with you- sautéing the meat rather than using the IP is a much quicker method of cooking meat. This particular recipe was written with a tougher and less expensive cut of meat in mind, Round Steak, which is tenderized easily in the Instant Pot! Give it a try I think you’ll love it. Let me know! I’m very interested in how you liked this recipe, how you liked cooking with the IP and how the deer meat worked! Please let me know your results. Can I use venison instead of beef and how do I adjust the cooking time? Yes, you can use venison. I would use the same time as cooking beef. Please let me know how it tastes! This recipe is simple and so delicious. I hope your family enjoys it. You mentioned using Elk and my husband just brought home his first one. Would you use the same time with Elk meat? Thanks! Congratulations to your husband, and I bet your freezer is full! Go ahead and use the same cooking time, the elk will taste great with this recipe. I made this and mine tasted like roast…was I not supposed to move the top lever to sealing? This was the first recipe I made in the Instant Pot. Yes, always use the seal position while cooking in the IP. Not sure why it tasted like roast…did you use the seasonings called for in the recipe? I’ve received lots of positive feedback on this recipe through social media! 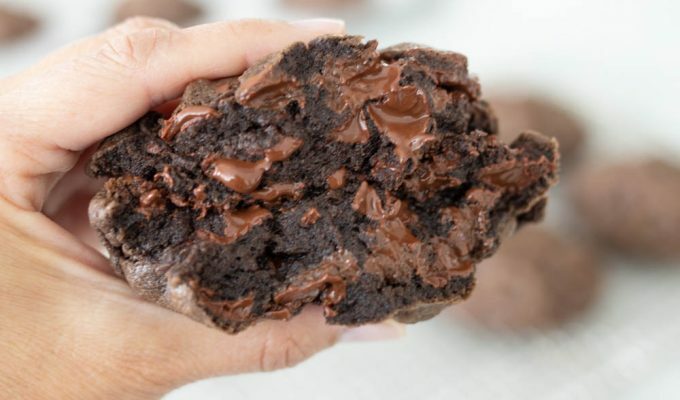 made these tonight instant pot success!! very tasty no leftovers. I used a flat iron steak probably will stick to a 25 min mp next time as these were almost to tender!! Thanks for your positive feedback and for reading ABK! We’ve made this a few times and enjoy it! However is there liquid with you after all is said and done? I thought all of the cooking liquid would be gone but it’s not. There is still a bit of liquid in the pot. Check out the picture on my post and you can see how much liquid I have left. Instant Pot Fajitas. Sorry you didn’t have good luck with this recipe. I’ve made it several times and had success, as have many readers. And I’ve never heard of anyone getting the BURN message! Yikes! Thanks for your feedback. If you have time, I always thaw the meat first. If using wild game, I believe thawing works best before cooking! This was so delicious, the seasonings were perfect and the meat came out so so tender! I added a half cup of broth and had too much liquid so will add less next time! the recipe calls for 1/3 cup try that next time! The liquid from all of the veggies also add a lot of liquid to the recipe when pressurized! Thanks fo reading ABK and for your feedback. I made this last night. I always have a problem with my meat being overcooked when I saute it, so I gave this a try. Really great results – meat was super tender. I added mushrooms in with the meat too. I actually made baked burritos using this recipe. 1/2 cup steak fajitas (drained the liquid), 1/4 cup white rice, a handful of chopped avocado, and a sprinkle of cilantro rolled up in each burrito. I filled a 8×12 with 9 burritos and poured a red sauce (tomato sauce, cumin, garlic powder, sugar, cilantro) over them. Then baked uncovered for 25 minutes @ 350. Husband loved it, and our 10 month old loved it too. I love this recipe. Thank you for sharing it. like you, we have a freezer full of game meat, but we also have freezers full of fish. I made this tonight in my InstaPot using halibut & it was excellent, but I modified the browning & cooking time a bit. On Sauté , I threw in the peppers for a few minutes then dumped the spiced halibut in to sauté for just a couple minutes, then poured on the lime juice & the broth, then sprinkled on the flour and stirred it up. Then I sealed it in steamed it for five minutes. It was perfect. Thanks for the ideas. I’ve never tried this with fish, and not sure I would have in the Instant Pot! Glad to hear this worked so well for you. Thanks for sharing! So, just making sure, this really cooks for 35 minutes? I have done babyback ribs that are tender in 30. That just seems like a very long time??? Hi Dale, you can try it for 30 minutes and see if it’s cooked enough. This is just the time that I found to cook the meat thoroughly. Thanks for asking!